I was out on my work Christmas “do” last night. I’m old now, so after a weekend that involved a wine-tasting and a dinner out with some friends, there wasn’t much chance that I was going to end up rat-arsed in a casino at 3am on a school night. In spite of a very modest alcohol intake (the red wine provided was filthy, which probably helped with that), I managed to have a really good evening. Usually with these things, you go out for a meal in a bar somewhere and things just go from there. Last year, I think we went to the Greyhounds, and in the past I’ve gone bowling and things like that. Not very exciting, perhaps, but these are your work colleagues after all. 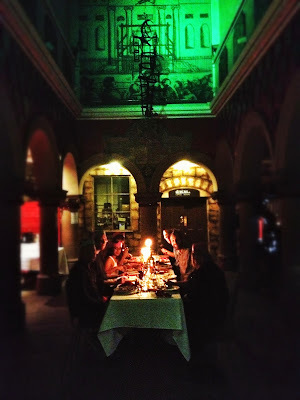 My team did something a little different this year: we went on a ghost walk and dinner at Nottingham’s Galleries of Justice. This building dates back to the fourteenth century and contains a courtroom, Gaol and police station, so you could be arrested, sentenced and executed all in the same place. On arrival, we had a bit of time to wander around the exhibition on the Kray Twins (which seems a little odd, given they don’t have any sort of a connection with Nottingham). I was, however, rather taken with these fantastically sinister looking riot policemen. Is it just me or is there more than a touch of Doctor Who / Terminator about these guys? I loved the feedback board too. I mean, who doesn’t like penguins? Soon enough though, it was the main event: a ghost walk through the courtroom and dungeons, all lit only with tealights. The actor who took us around did a fantastic job, I thought, in conjuring up an atmosphere. She apparently thought I was brave on the grounds that I was usually the first person through doors into darkened prison cells and didn’t really mind being shut up in the oubliette…. Well, perhaps compared to some of the guys I was with, but I think I’m a rational enough person that I don’t really believe that spirits from the past wander around the place rattling chains. I’m not saying I’d like to be the person who has to wander around after everyone else has gone home putting out all the tealights in the dungeons or anything… but I’m not suddenly likely to start believing in ghosts and jumping at shadows either. I was reminded in places of Port Arthur in Tasmania… where the cruellest part of the prison is surely the one that the reformers built, where prisoners were kept hooded and in complete isolation. They have something similar in Nottingham and it’s chilling. You know where you are with a good beating, after all… but total sensory deprivation in the name of making prisons more humane? I don’t need to believe in ghosts to be able to feel the pain and suffering that a building like this, like the prison in Port Arthur, has seen over the years. It was an interesting tour. 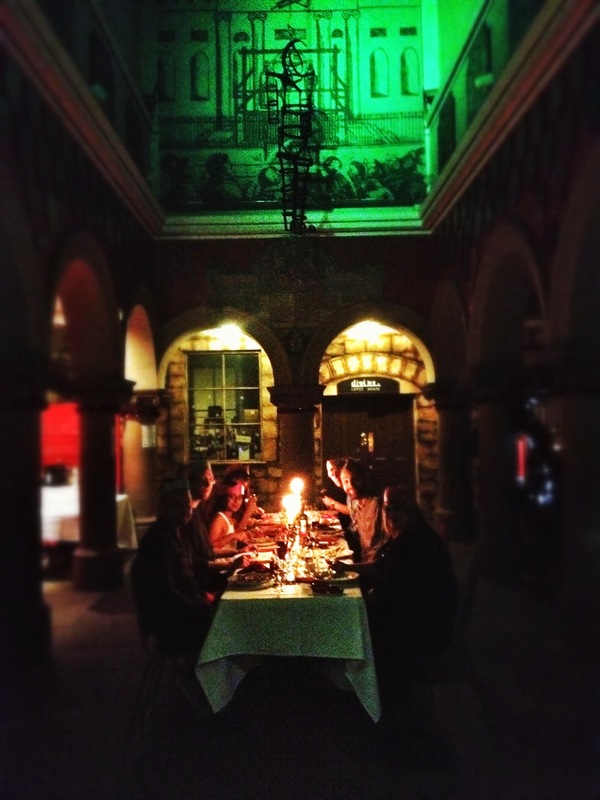 Also, who doesn’t enjoy having dinner underneath a gibbet?